CIMSEC is excited to share that the Hudson Institute’s Center for American Seapower will release on 8 October on Capitol Hill a report on the future of the aircraft carrier. Titled “Sharpening the Spear: The Carrier, the Joint Force, and High-End Conflict,” it systematically analyzes Carrier Strike Group vulnerabilities and offers a number of innovative recommendations in terms of concepts, capabilities, and capacities. This article is inspired by the forthcoming report. 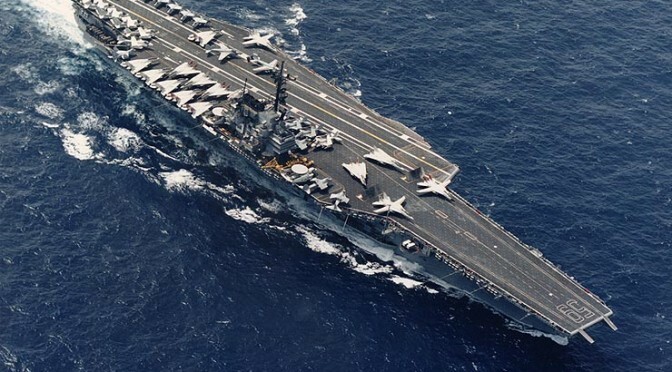 In the period following World War II, the U.S. Navy sought to leverage its relatively uncontested sea control to develop the capability to conduct nuclear strike missions from carriers. Until the removal of carriers from the Single Integrated Operational Plan in 1976, the nuclear strike mission led to the development of heavy attack aircraft that could conduct long-range missions against Communist targets. Carrier aviation also played a crucial role in providing fighter, attack, and electronic warfare aircraft for employment in conflicts in Korea and Vietnam. Anti-Submarine Warfare (ASW) aircraft carriers were decommissioned in 1975, thus concentrating airborne ASW capability in the now multi-mission large deck carriers. During the 1980s, a carrier air wing normally consisted of nine squadrons of various aircraft: two F-14 fighter squadrons, one E-2C AEW squadron, one EA-6B electronic warfare squadron, one S-3 ASW squadron, one A-6 medium-attack squadron, two A-7 light-attack squadrons, and one helicopter squadron, for a total of approximately 90 aircraft. In the 1980s, the Navy decided to introduce the F-18 in order to replace the A-7. Trading range for speed in order to increase aircraft survivability, the F-18’s 370 NM combat radius paled in comparison with the A-7’s 608 NM combat radius, drawing significant criticism. Test pilots decried: “Replacing the A-7 with the F-18 will constitute a reduction in battle group standoff range from the enemy and/or a reduction in ordnance delivered per aircraft on the target with no measurable increase in accuracy. […] Our current ability to engage the Soviet fleet at ranges well beyond that of their newest surface-to-surface weapons will markedly diminish, and the vulnerability of our battle groups in war at sea will increase concomitantly.” The F-18 (and its successor Super Hornet) would replace the F-14 as well, continuing a trend of reduction of range in the air wing. Additionally, the air wing’s medium-attack aircraft, the A-6 (with a combat radius of approximately 1,000 NM) was retired in the 1990s and the A-12, its envisioned long-range, stealthy replacement, was cancelled. By 2015, a typical carrier air wing consists of two squadrons of F-18C/D Hornets strike aircraft (10-12 aircraft per squadron), two squadrons of F-18E/F Super Hornets strike aircraft (10-12 aircraft per squadron), one squadron of EA-18G Electronic Attack aircraft (5 aircraft per squadron), one squadron of E-2C/D AEW aircraft (4 aircraft), and varying numbers of SH-60 and MH-60 helicopters, for a total of approximately 64 aircraft. The C-2 Carrier Onboard Delivery detachment aircraft do not fall under the CVW construct. The air wing eliminated S-3s that had provided organic open ocean ASW capabilities, replacing it with the short range SH-60 helicopter. Moreover, the carrier’s dedicated organic aerial refueler, the KA-6D, had been replaced first with tanking from the S-3B following elimination of its ASW role, and then solely with buddy tanking from F-18Es and F-18F’s. This significantly reduced the organic range of the air wing, made the air wing more reliant on Air Force tanking, and reduced the number of aircraft in the air wing available for combat missions. Compared to the 1980s, the contemporary air wing is significantly smaller. In the 1980s a typical air wing had approximately 90 aircraft, 60 of which were fighter or strike aircraft; in contrast, contemporary air wings hold a mere 64 aircraft approximately, 44 of which are fighter or strike aircraft. Consequently, the fighter or attack portion of the air wing has been cut by more than a quarter and the total size of the air wing has diminished by approximately 30%. The planned introduction of the F-35C to the air wing is expected to further cut the size of squadrons by 2-4 aircraft. The F-35C’s low observable features, advanced sensors and networking, and approximate 613 NM combat radius will improve carrier fighter performance compared to the 390 NM combat radius of the F-18E/F. Overall, though, the size of the air wing has been shrinking. Ironically, the Navy has gone on to procure the FORD Class carrier, capable of embarking more aircraft and conducting operations at a higher sortie rate than the NIMITZ Class. In summary, contemporary and projected air wings display three key characteristics: they are shorter in range than Cold War predecessors, host significantly fewer aircraft, and lack dedicated fixed-wing aircraft for ASW and aerial refueling. Differences between the current and projected air wing include the addition of the F-35C and potential incorporation of a carrier-launched unmanned aircraft system. Of note, Section 220 of the FY 2001 defense authorization act stated, “It shall be a goal of the Armed Forces to achieve the fielding of unmanned, remotely controlled technology such that by 2010, one-third of the aircraft in the operational deep strike force aircraft fleet are unmanned.” Clearly, the Joint Force has failed to meet Congress’ 2010 goal. On 8 October 2015, the Hudson Institute’s Center for American Seapower will release a report that will examine whether it is worthwhile to continue to build large, nuclear-powered aircraft carriers, given their considerable cost and mounting Anti-Access/Area Denial (A2/AD) threats to sea-based operations. In our report, Seth Cropsey, Bryan McGrath, and I will systematically analyze the employment of the carrier air wing as an element of a Carrier Strike Group and as a component of the Joint Force. The report will examine the role that carrier strike groups (CSGs) play in current and projected concepts of operation, especially against mature and evolving A2/AD threats such as China. We can say that the current air wing has inadequate capability, range, numbers, and qualitative superiority to adequately counter the most challenging threats, in particular the threat posed by China. Given the growing importance of carrier aviation in Joint CONOPS, as Chinese sea control threats and threats against land-based tactical aviation rise, the Navy should address the existing and projected capability gaps in the carrier air wing. In general, this requires the Navy to increase air wing striking range, develop sea control aircraft, and develop new weapons. Lastly, the Department of Defense and Congress should critically evaluate the naval aviation portfolio, including potential portfolio trades between land-based, permissive environment aircraft and sea-based, contested environment aircraft. We thank CIMSEC for the opportunity to share these tidbits and look forward to sharing the more detailed study with you at its roll-out on 8 October. Timothy A. Walton is a principal of Alios Consulting Group, a defense and business strategy consultancy. Norman Polmar. Aircraft Carriers: A History of Carrier Aviation and its Influence on World Events, Volume II-1946-2006, Washington, DC: Potomac Books, 2008, 302. Richard Halloran. “Test Pilots Say Dual-Purpose F-18 Jet Is Unsuitable in Bomber Role”, The New York Times, 11 November 1982. N.B. 4-6 of an air wing’s F-18E/F aircraft are normally used for the buddy tanking mission. “Selected Acquisition Report: F-35 Joint Strike Fighter Aircraft (F-35)”, Department of Defense, 14, http://breakingdefense.com/wp-content/uploads/sites/3/2014/04/F-35-2013-SAR.pdf#page=14. Ronald O’Rourke. “Unmanned Vehicles for U.S. Naval Forces: Background and Issues for Congress”, Congressional Research Service, RS21294, 25 October 2006, http://www.fas.org/sgp/crs/weapons/RS21294.pdf. Excellent piece! Good point regarding the speed/range survivability trade-off. Looking forward to the Joint CONOPS discussion in the report. Pundits usually examine platforms independently instead of as part of a system. Great article…very informative and clearly written. I’m looking forward to discussion of implications in the upcoming Hudson report. May I suggest that you use available NATOPS performance charts rather than NYT opinion articles to calculate specific range and fuel consumption. Depending on configuration, the F/A-18E/F combat radius can be up to twice the number you have provided. The May 1982 Congressional Budget Office study “Costs of Expanding and Modernizing the Navy’s Carrier-Based Air Forces” lists the F/A-18A range as 706, the A-7E as 796, and the A-6E as 1000NM each carrying four MK83 1000# bombs and a combination of drop tanks. The Super Hornet carries 33% more internal fuel than the legacy Hornet, it is illogical to suggest given similar configurations the E/F would have only 20NM more range than the A/C (390 vs 370 per your article). In fact, the F/A-18E carries only 1300# less internal fuel than an A-6, and the F414 and J-52 have similar specific fuel consumption at cruise. An unrefueled Super Hornet with a single centerline external fuel tank will carry two 100+ NM standoff weapons (JSOW or LRASM) 700NM from the carrier. Add Conformal Fuel Tanks and it’s an 800+ NM striker. On the other end of the spectrum, Super Hornet is capable of launching with a larger load than the venerable A-6 Intruder. F-35C will carry nearly 20,000# of fuel internally, so it will likely be able to get out past 700NM without external tanks. Again, all of this is without considering inflight refueling. KA-6Ds were not purpose built tankers; they were rebuilt high-hour A-6As. While using a Super Hornet as a tanker is not the optimal use of a strike-fighter, it can put 29,000# of fuel airborne – more than any other carrier aircraft since the KA-3 – and still carry air-to-air weapons. MAGIC CARPET is expected to significantly reduce the number of tanker sorties required, as well. The MH-60R may not have the speed of range of the S-3, but it is a vastly superior ASW platform, and with Hellfire it is a potent ASuW/counter-swarm aircraft. All the ASW equipment and enlisted operators were removed from the S-3 in the early ’90s. While not organic, the P-8 is no slouch either. The gap in numbers can be remedied by a relatively low cost, moderately low observable, high endurance, unmanned light strike/reconnaissance/sea control platform. It could probably also be configured to act as a tanker. There are 3 or 4 low-risk designs that could be fielded in short order. That capability is exactly what most in naval aviation want out of UCLASS, vice the hyper-expensive all-aspect broadband stealth autonomous mini-B2 that Messers Clark and Cropsy have previously advocated and I expect wish to justify via this study. If you cook the books with the numbers, it is easy to contradict your statistics, and ultimately call your conclusions into questions. Thank you for your careful reading, and I apologize for my delay in responding. To state up front, no one is “cooking the books” and none of the authors sought to “justify” anything. My use of the 1982 New York Times article was to demonstrate the 1980s debate on speed and range, not to illustrate the contemporary F-18’s range. I agree that I should have used more clear language regarding terms like internal unrefueled combat radius and combat radius in order to make a more accurate comparison. If the F-35C can fly past 700 nautical miles without external tanks or inflight refueling, that would be excellent. The 2014 Selected Acquisition Report is less sanguine, though, for a profile with two, 1,000 pound JDAMs and two AIM-120s. Our forthcoming report has detailed modeling that accurately captures the significant strike capability and capacity of the existing air wing (even up to fifteen hundred nautical miles), while recognizing its major weaknesses and vulnerabilities. I agree KA-6Ds were not purpose built tankers. I only conveyed they were the air wing’s dedicated organic tanker during that time period. I agree there are certain advantages of the MH-60R’s dipping sonar, but I also think a modern ASW fixed-wing aircraft would confer complementary advantages. I hope you read our upcoming report. I am confident you will find it quite compelling, and if you have any follow-up questions or comments, please call or write.